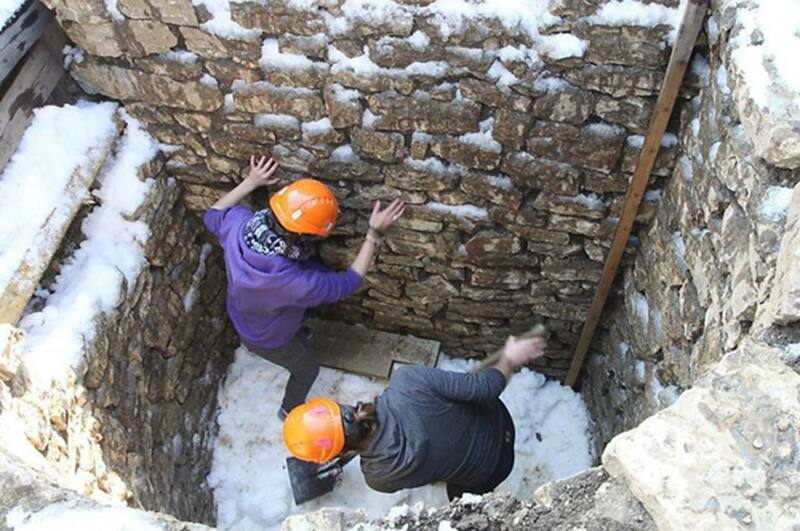 Swiss archaeologists seem to have solved a mystery at a famous Roman site. They have come to the conclusion that some mysterious shafts at the archaeological site were used as a method of refrigeration. The team believes that this is how the Romans preserved their food in the ancient city. Although controversial, the theory could help experts understand the enigmatic pits that have long baffled investigators. The team have been working at the archaeological site and open-air museum of Augusta Raurica, some 20 kilometers (14 miles) from Basel. The site had originally been a Roman colony - the oldest known colony on the River Rhine. It became a large urban center and eventually the capital of the local province. It was devastated during an invasion by Germanic tribes during the 3 rd century crisis and the population was re-settled elsewhere. The site is rich in archaeological remains, including a basilica, forum, theater, and aqueduct. There are also a set of shafts that run some 4 meters (12 feet) deep into the earth. The reason for the construction of the shafts has long perplexed experts. Various theories had been put forward, including one that the shafts were used as places to refrigerate supplies. According to SWI, the ‘Romans are known to have used such holes to store fruit, vegetables, oysters, cheese and other products that go off’. A team led by Professor Peter-Andrew Schwarz at the University of Basel decided to conduct a test to determine if the shafts could have been used to refrigerate food and drinks. They developed a simple experiment, they placed a bottle of beer and other items into a shaft in April 2018. They then, according to The Local website, ‘packed in compacted snow-ice and covered with straw’ in the shaft and its walls lined with straw to see if the beer and other products could be refrigerated. This technique was based on one that is still practiced on the Spanish island of Majorca. Last week, four months after they placed the items into the shaft the team of experts much to their delight discovered that the items were still cold. This test does not prove conclusively that the mysterious shafts were used to refrigerate food and drink. It does show that it is possible that this was the case. The Local reports that this is the ‘’third and most successful time the team has attempted to recreate the Romans' cool box’’. Previous attempts had not been successful, even though ice and snow had been employed. When the team members from the University of Basel found that the beer was still chilled, they celebrated by drinking it. The Swiss team now believe that the shafts at Augusta Raurica were used to keep food and stores cool and fresh during the hot summers. The, shafts, as in their experiment were filled with snow and ice during the winter and early Spring. This helped to keep the shafts cool, as did the fact they were underground. This would mean that the local population could keep supplies fresh some time into the summer months. The ability to preserve food would mean that the inhabitants of Augusta Raurica had access to perishable foodstuffs for more of the year, perhaps contributing to the growth and development of the colony. The site at Augusta Raurica has provided many important insights into life in the Roman provinces. The experiment conducted by the Swiss team may show that the Romans had developed a sophisticated way to preserve their food. It should be noted that while the test indicates’ that the shafts could keep stores, the team acknowledged that the shafts do not appear to have been able to keep produce cool for an extended period. It seems likely that there will be those who will not accept the theory that the shafts were used for refrigeration, but this test has proved it to be a possible function. The thinking behind this is sound. It's not isolated to this site either, it's applicable to all historical sites. We could be missing something hugely important. Just because a site is repurposed by an elite as a burial chamber does not imply that this was there intended purpose from construction. There are Babylon sites that use that take in cold nighttime air to regulate temperature in the day (a natural refrigerator using no power, OK slightly different method). All these beehives tombs on the islands may have once been winter food storage chambers (it is a much better match). Completely dug in too, so raiders, don't get your Winter food. It's been overlooked just how important this is, the Egyptian had a 7 year food reserve when Thera erupted, with the proceeds they purchased huge amounts of land! Great article. It would be well worth considering the need for a society to store food for winter (we don't think of this today as food is abundant) but in ancients times you were one failed harvest away from perishing and your entire society collapsing (leading to raiding).